Scotland lock Richie Gray believes that a move to French giants Toulouse next season is the perfect challenge to take his career to the next level. 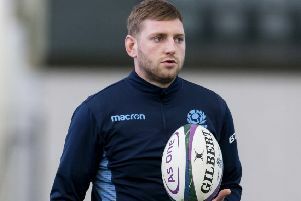 The towering 6ft 10in second-rower, who has 51 caps for Scotland and played a Lions Test in 2013, has agreed a four-year deal with the former European champions and will leave current club Castres for their Top 14 rivals at the end of the season. The 26-year-old played a vital role for Vern Cotter’s Scotland side as they impressed on their way to the World Cup quarter-finals. He left Glasgow, where his brother and fellow international Jonny is now captain, in 2012 to move to Sale and then on to Castres. After a strong showing at the recent World Cup, he hopes to reach new heights with one of the European game’s most successful clubs when he switches to the Stade Ernest-Wallon next summer. Gray said: “This was a very difficult decision. I have loved my time in Castres. The club and the supporters have made my time here very special and I will leave with very fond memories. “However the opportunity to play for one of Europe’s most successful clubs, steeped in history, is an incredible one for me. When I met with the club they described their ambition and I felt this was the right move for me, to challenge myself in what is a very strong squad. “I still have seven months here at Castres, I will give everything I can to the club in hope of achieving top six and then who knows. Toulouse are desperate to return to the top table of French and European rugby after slipping into the shadow of Toulon and facing challenges from the likes of cashed-up Parisian club Racing 92. Meanwhile, Scarlets scrum-half Aled Davies has signed a new deal with the Welsh region until 2018. The 23-year-old has made 72 appearances for the Scarlets and took over as first-choice scrum-half last season when Wales international Gareth Davies was injured.